The EcoHitch® stealth hitch for the 2013-2019 Subaru BRZ and 2013-2016 Scion FR-S is designed to be completely concealed and has a removable receiver when not in use so you don't have to see a crosstube underneath your vehicle. Rated for 200 pounds tongue weight and 1,000 pounds towing weight, this BRZ trailer hitch keeps up with the pure sports car handling of the Subaru BRZ. *If you’re going to be towing and need trailer wiring, click here! Ensure your wiring harness does not drag on the ground by visiting our Eclipse trailer wiring bracket page. Uniquely designed to have the soul of a sports car but contain the heart of a Subaru, you get the best of both worlds with your Subaru BRZ. We manufactured the perfect hitch for Subaru BRZ that balances the contours and naturally symmetrical design of your car so out of the starting gate you get great performance of your Subaru BRZ EcoHitch. The EcoHitch stealth hitch for the Subaru BRZ comes in both 1.25-inch and 2-inch receiver sizes so you get your choice of which bike racks and cargo trays will work best for the receiver you choose. The Scion FR-S EcoHitch® stealth hitch is designed to be removable when not in use, so no one will know you have a trailer hitch installed unless you are in the process of using it to haul your bikes or extra cargo. The Stealth BRZ hitch is made from recycled metals making it eco-friendly and lightweight. 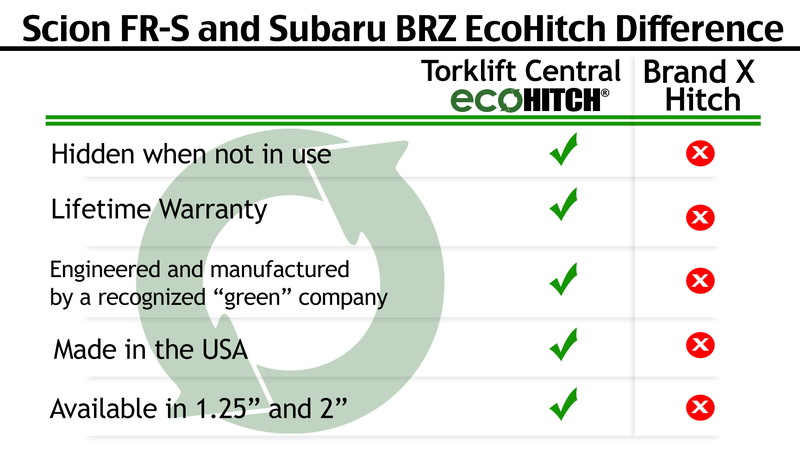 With 200 pounds tongue weight and 1,000 pounds towing weight capacity, our Subaru and Scion hitch gives you the ability to have an amazing ride in your BRZ without compromising balance and the center of gravity of your favorite sports car. No drilling to the frame is required; the hitch utilizes a bolt-on application. This hitch has the highest level of ground clearance out of all the EcoHitch® models available. *WARNING* Your vehicle may have a lower tow rating than this trailer hitch. If your vehicle's tow rating is less than the rated towing capacity on your Torklift Central trailer hitch, your trailer hitch capacity is limited to your vehicle's factory rated towing capacity.